"I pray people stop and think…"
Those words are part of an interview a Gold Star Mother gave to her local paper and that is published today. THIS picture is of her son, Josh Rodgers. 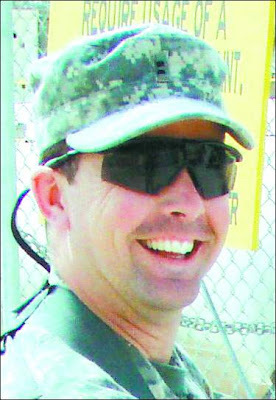 CWO2 Rodgers was killed in Afghanistan May 30, 2007. I have been aware of this family for quite some time as my friend Don goes every Friday to do a 2 mile Red Shirt Friday Walk to honour Josh’s memory. Yes, the brat is on the walk by virtue of a picture of me that Don has attached to one of his flags that he flies proudly. We agreed that Don would do this, so that all of Josh’s family knows they have prayers and support from outside America. It is important to me. Today, especially, I ask you to go read about, and meet, this amazing family. You can find this family on the Nevada Appeal site here. Then, as you go about your July 4th celebrations, take a minute – or more – and reflect on ALL the amazing American families, both throughout history and in our times, who are paying the price of service. They deserve that, at the very least. Standing are Andrew Candia, David Paul Candia, Michael Scott McElfish, Debbie and Ben Walker, Matthew McElfish, Dawn Michel, Mike McElfish and Ryan McElfish. Sitting are Susie McElfish, Lindsey McElfish, Linda Moshier and 2-and-a-half-year-old Emily Candia at Eastside Memorial Park on June 26. Chief Warrant Officer 2 Joshua Robert Rodgers is buried at the Minden cemetery. He died in Afghanistan on May 30, 2007. Cross-posted at NewsBlaze, Assoluta Tranquillita, Tanker Bros and Wake Up America! Filed under: Josh Rodgers, Nevada, Red Shirt Friday |	Comments Off on "I pray people stop and think…"